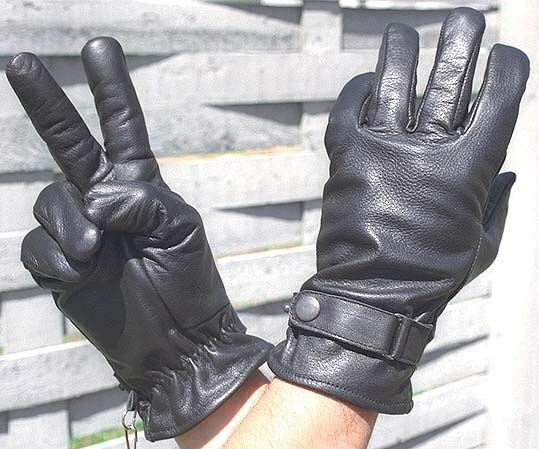 Gloves first appeared in ancient Egypt, and in the twelfth century there is a new profession - Glover. This craft was very honorable, and gloves were worn only by aristocrats. Try to sew the gloves on their own. Prepare flaps of skin: strut old bag, jacket or buy glove leather fabric, better lined with fur, this material is easy to sew. Pay attention to the top side of the fabric, so she was without stains and holes, because it will be the front side of the product. You will need two pieces of size thirty-five by fifty inches. Download the pattern on the Internet, open any graphics program, where you can see the sizes inches. Tape measure centimeter of the width of the hand across the palm, fingers, height, compare with the picture. Adjust the pattern while preserving the aspect ratio. Print it, cut it out, leaving half an inch for allowances. Fold the skin in half. Put the pattern on the front side of the material. Separately, find a place for parts of the thumb. Cut out the model using a special knife or razor. Keep in mind that the right and left hand are arranged symmetrically. You should now have the following parts: main panel, six intermediate wedges, insert a thumb. Pick a strong thread in the color of leather (can work and thread contrasting colors), the usual strong needle. Start with the left hand. Sew manually between the two pairs of wedges end parties. Connect the wedges with the glove, starting from the base. Lousy wedges, periodically try on the glove on your hand, test the size. Side part sew thumb seam "over the edge", leaving an unfinished tip. Attach the thumb sewn to the glove, the contours of the pattern holes, and the part itself should be the same. Cleave the pin, sew. Put the product on hand stretch, make sure the fingers are not cramped. Finished sewing up the tips of the fingers. At the end sew the sides from the pinky to the base. Trim the edge, the remaining thread. Right glove sew similarly. If you have chosen a skin with a fur lining, make a striking, fluffy lapel. Need and exclusive thing ready, your skilful hands will be comfortable and warm in the new signets.